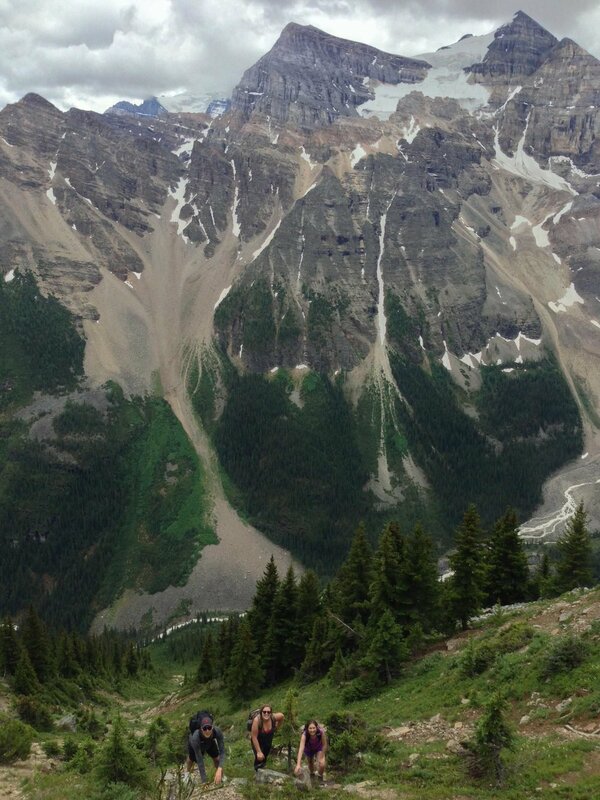 We are very excited to share our first post from a recent hike at Lake Louise for Canada Day. There is no better way to celebrate all that we love and admire about this wonderful country than to spend the day exploring and appreciating its unique raw beauty. Lake Louise is an iconic landmark of the Canadian Rockies, known worldwide for the colour of its water and its stunning backdrop, the Plain of Six Glaciers. Many of our most memorable travel experiences have been the result of receiving local advice. There is no substitute for the expertise that can't be found in a guidebook on many occasions it has led us to discover hidden gems, even in the most well-known of places. We are thrilled to return the favour to those visiting Lake Louise and provide advice on a relatively unknown hike that provides a new perspective to the classic view. While many try to avoid Lake Louise due to the crowds, we felt profound pride to see so many visitors admiring Lake Louise's natural beauty while waving around miniature Canadian flags. A love for the outdoors is not only the central theme for our website but a fundamental part of the Canadian identity. After a few pictures along the shoreline, we eagerly threw on our packs and headed for the Lake Agnes teahouse hoping to try out a hike that reached higher than the Big Beehive, aptly named the Devil's Thumb. Upon reaching the teahouse we wandered for a few minutes to the back of Lake Agnes until we found rock slabs suitable for our picnic lunch. The majority of hikers stop here, unaware of the incredible views found less than 30 minutes up the trail on the 'Big Beehive' promontory. This view is is earned through an ascent of 120 meters by way of 6 steep switchbacks and turning left (following posted signs at the top). With our minds set on reaching the Devil’s Thumb, we opted to turn right at the top of the switchbacks and this led us on an unmarked path. After a brief but enjoyable climb up a small rock wall (we're being overdramatic by calling it a rock-wall), we entered an unmarked trail that connected us with the Highline Trail. This lead us closer towards Mt. Victoria and provided a stunning view of the Victoria Glacier. Climbing the Devil's Thumb was a challenging ascent (we're not being overdramatic here) and it required moderate scrambling on all fours. There was no visible trail and the loose scree made it difficult to gain a steady foothold. Ben, a perpetual optimist, described it as an opportunity to get our hands dirty. The near-vertical scramble placed us at the top of a saddle between two high peaks. We turned right (back towards Lake Louise) and navigated our way over large boulders that led us to the fingernail of the proverbial Devil's Thumb. The view of Lake Agnes and Lake Louise side-by-side was remarkable and made a tough day hike worth every step.